I'd somehow deactivated comments on this post, so this is in response to "coco"'s questions about this post, which she posted elsewhere. The 1914 fire began in the Brodie Duke building - a four story structure in the middle of the north side of the 100 block of West Main. Woolworth's was on the first floor, and their storage on the second. A minister walking by saw "a wisp of smoke" coming from a second story window. The fire deparatment nearly had the fire under control, but the water main broke, and the fire devastated most of the block between Parrish, Main, Corcoran and Mangum - damaging or destroying 20 structures. That info and the info on the coin toss were gleaned from Wyatt Dixon's book "How Times Do Change". Main St. and Chapel Hill St. were converted to one-way streets in the early to mid-1970s. My husband is the grandson of Samuel McAfee Snider, Owner of Snider-Fletcher Jewelers a 1930s Jewelry store in Durham. We are interested in any information you may have available regarding said store and/or owners. Robert L. Fletcher was husband of Lillie Snider Fletcher, aunt of my husband. We are researching the family tree and need any and all materials available. Thank you for any help you may be able to give us. Hi there. I'm a Duke undergrad writing a paper about the MA Angier ledgers from his store. Specifically I'm working with the 1895-1896 ledger, which appears to be the year the store was incorporated. I can't find any evidence of the store in papers/ads/other documents post-c.1910. Do you know any more about that store and what happened to it? Thanks. The intersection of Main St. and Mangum St. could be considered the center of Durham. Except for the rather odd Chapel Hill St., Main St. forms the dividing line between "North" and "South" streets, and Mangum St. the dividing line between "East" and "West" streets. After the Civil War, other stores were opened, and two saloons occupied the eastern corners of Mangum St. and Main. In 1878, Eugene Morehead, son of Governor John M. Morehead (from whose name the Morehead Scholarship program at UNC derives) came to Durham as an agent of the Department of Internal Revenue, but soon began his own bank, the first bank in Durham, called the Morehead Bank. Above, the northwest corner of Main St. and Mangum St., 1884. Angier's General Store is on the right, the Morehead Bank on the left. Morehead soon partnered with Gerald Watts to run the bank, and Gerald's son George Watts would, with Morehead, establish "Morehead Hill" (because Morehead won the coin toss) around 1881. In 1889, Eugene Morehead died, and the bank became the Morehead Banking Company, with William Willard as president. 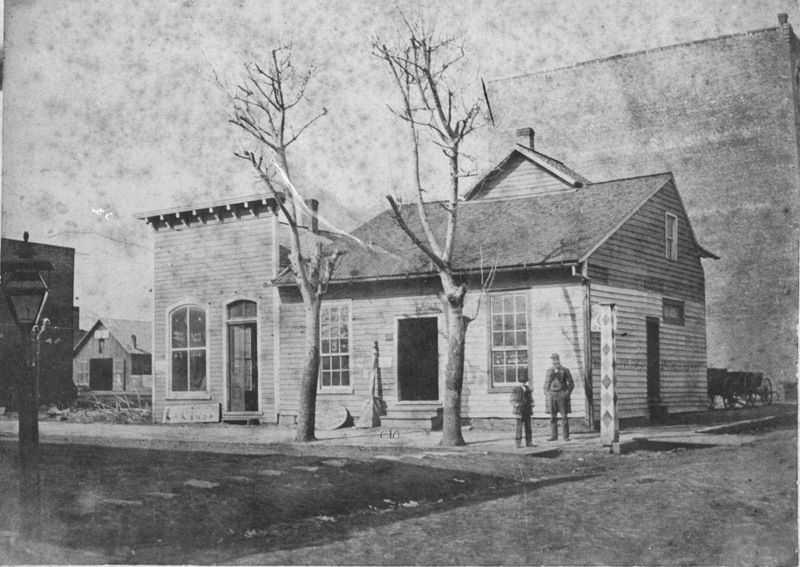 By the 1890s, the wood frame structures along Main St. were being replaced with brick structures. New storefronts were constructed at the northwest corner of Main and Mangum. The Morehead Banking Company moved to 105 East Main St. where in 1905, it would become the Citizens Bank. 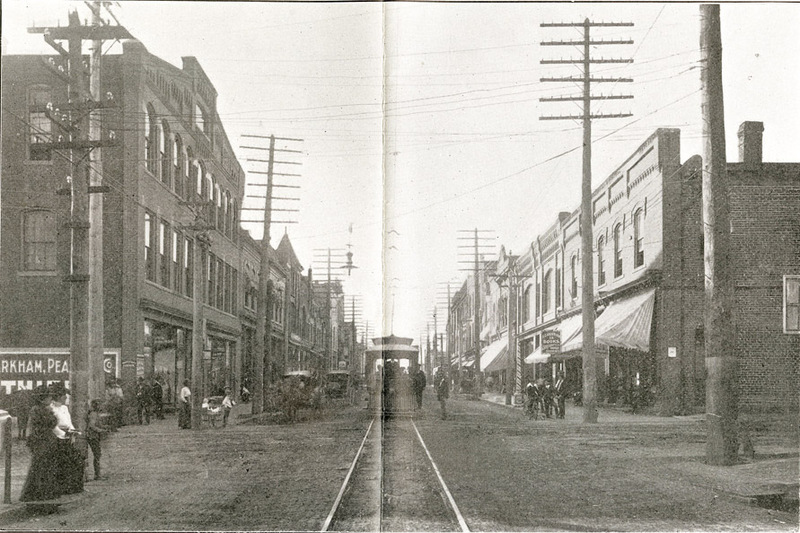 Above, West Main Street, looking west from Mangum St. in 1905. The building on the left (south) side of the street is the present location of the Kress Building. The first two buildings on the right side were located at the former site of Angier's store and the Morehead Bank. These buildings would be 102-104 and 106-110 West Main, respectively. By 1899 102 West Main was occupied by the Haywood King drugstore. 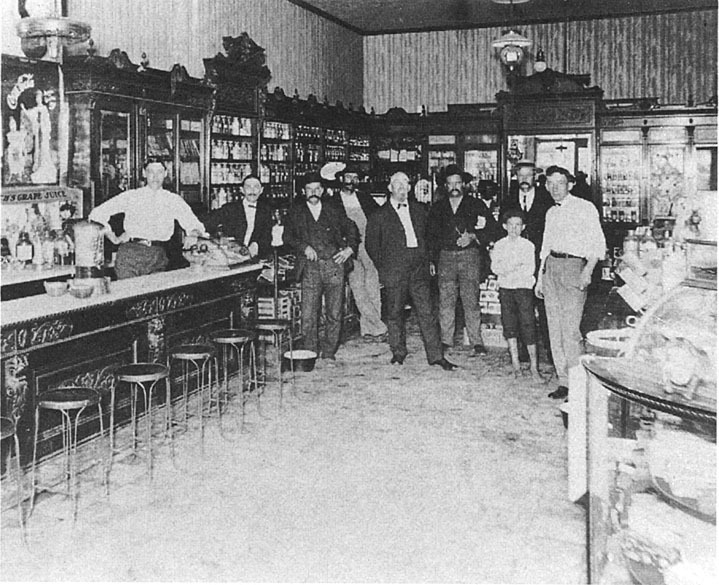 The interior of the drugstore, likely 1910s. It appears that when the fire of 1914 decimated the north side of the 100 block of West Main St., these buildings survived. While every other building in the block was replaced, the facades of these buildings appear to quite similar (102-104 has been altered on the front somewhat, but is the same building). 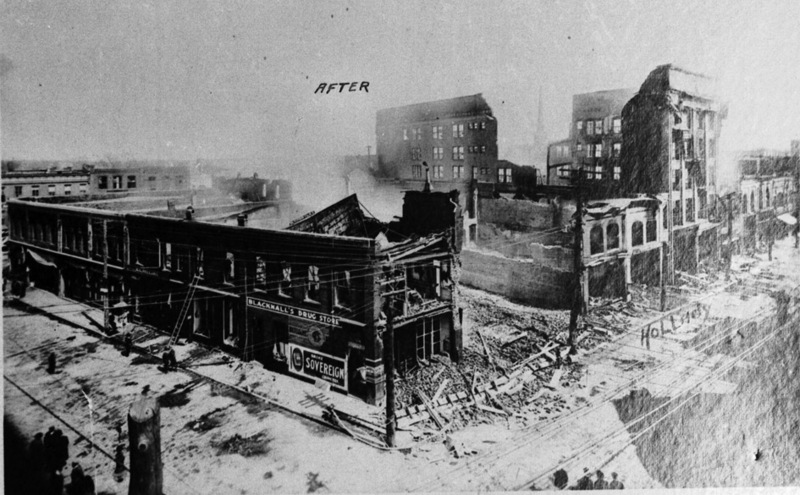 Above, after the fire of 1914. 106-110 West Main is at the right edge of the frame, 102-104 is not visible. Above, the view northwest from Mangum St., 1930s (after 1933). In 1937, Haywood and Boone sold this store to Walgreens, and moved to Mangum, Parrish, and Orange Streets. Walgreens operated here throughout the mid-20th century. Per John Schelp, who interviewed John Loudermilk, this was the store where Loudermilk picked up a candy bar (for his East Durham girlfriend - there evidently were a few) and flowers were on sale - inspiring him to write the song "A Rose and a Baby Ruth" in 1956. Looking west from the 100 block of East Main, ~1960. West Main from Mangum St., 1962. The Walgreens store in 1963, looking northwest from Main and Mangum. The stores at 106-110 West Main were beginning to look rather vacant by 1966. 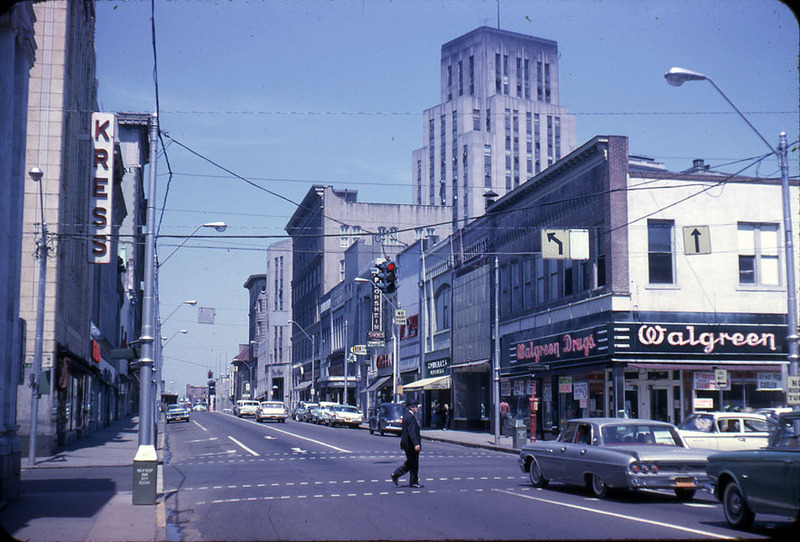 106-110 West Main in 1966. ... before being torn down in the early 1970s. Sometime after this, the vacant lots were landscaped as park space, which it remains today.